MOUNT UNION — It was deja vu all over again for Northern Cambria. For the second consecutive season, Mount Union stood in the way of the Colts in the District 6 Class 2A softball playoffs, and for the second straight year, the results were the same. 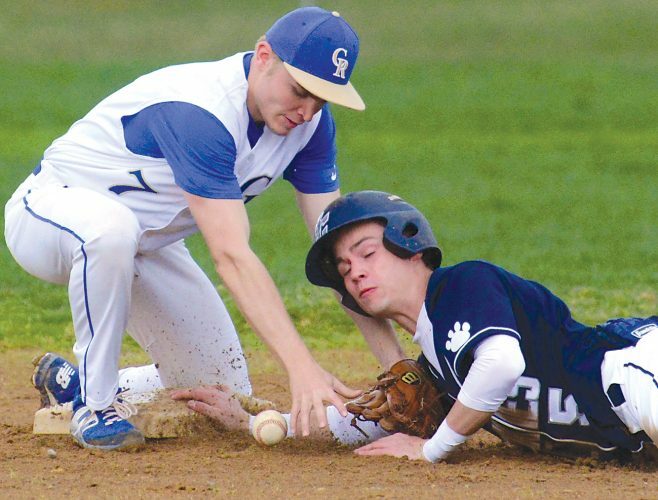 The Trojans advanced to the district finals for the second consecutive year after handing Northern Cambria a 10-0 defeat in five innings of their semifinal contest on Wednesday. Mount Union (19-1) will face today’s West Branch-Bishop McCort semifinal winner on Wednesday, May 30 at Saint Francis College in Loretto for the district championship. Northern Cambria closed out its season at 14-4 and Heritage Conference champions. Mount Union took a 3-0 lead in the bottom of the first when Taylor Fortney had a bunt base hit and scored on a Karrigan Woodward RBI double to center. Madison Harris followed with a walk, stole second, and Kadyn Cresswell brought both runners home with an RBI knock to center field. The Trojans broke open the game with five runs in the second — thanks to four walks, three hits, three wild pitches and one error. McKenna Shields led off with a solo shot to left to make it 4-0. Then the pitching woes and mental miscues spelled serious trouble for Northern Cambria. The Trojans scored three consecutive runs on wild pitches. After the Shields homer, a single by Destinie Myers, an error and a walk loaded the bases for Mount Union. A passed ball scored two runs and brought Krug out of the dugout and into a heated argument with the umpire. From this point on, the game got away from the Colts. Sarah Gearhart tossed a four-hitter to pick up the win, while Kaitlyn Kudlawiec suffered the loss, giving up six runs on four hits with three walks. Mount Union ended the game with two runs in the fourth. Taylor Fortney went 2-for-2 to lead Mount Union, while Sydney Sheredy collected two hits for the Colts. Next up for Mount Union — the artificial turf at Saint Francis and a definite concern for Fiscus. HR–Shields (MU). 3B–Bernard (NC). 2B–Roher, Woodward (MU). Multiple hits–Sheredy 2 (NC), Fortney 2 (MU). RBI–Cresswell 2, Woodward, Brumbaugh, Shields (MU). WP–Gearhart. LP–Kudlawiec. SO–Gearhart 2 (MU). BB–Bearer 4, Kudlawiec 3 (NC).